Posted April 2, 2018 by Diane & filed under Story Bites Writing Prompts. Maybe you’ve heard the old bit of writing advice that tells you to “show, not tell.” That’s an important adage to keep in mind when you’re working on characters. Readers get their strongest sense of a character through what a character does (action scenes!) or says. In this post, we’re going to work on that last part, dialogue. We’re going to just touch upon our characters’ personalities first. 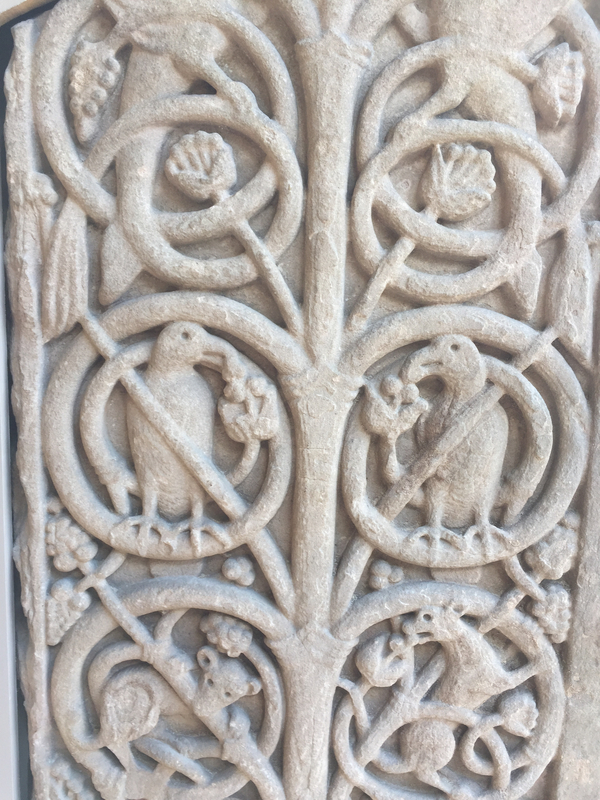 And your characters are the four critters in the bottom two-thirds of this stone carving: the crows and the dog/monkey/rat-like beasties. They’ve been trapped in the stone for hundreds of years. Does the creature think it will ever get out of the stone, or not? Is it happy being in the stone? If so, what makes it content? If not, what does it hate most about being trapped? Do you have a sense of your two characters now? Now for our story bite: With at least four exchanges between them (one character speaks, the other answers), have them discuss what you’ve just written. But before you start that, let’s give each of your characters a distinctive voice. Does your character use full sentences like this? Or talk in brief like this? Does your character prefer to say “does not” or “don’t”? Does your character put verbs before or after nouns (a glorious countryside, or a countryside glorious)? Does your character use a lot of adjectives (in a perfectly ordinary, yet somehow magical, and truly endearing, sort of way), or speak with short tight words? Choose one or more of those aspects of speech for each of your two characters, and write what you’ve come up with above in that way. This may reach a full page with your four exchanges. Writing dialogue can be a lot of fun, and I hope this is fun and that your characters surprise you. Thanks for giving this one a try—and giving those stone beasties a chance at life. Aww, thanks so much, Donna. I hope it inspires other writers of all ages!